The lovely colors of autumn had touched Oxfordshire by the date of the wonderfully romantic and happy nuptials of Emma and Richard. The Bicester Country Club, with the green of its beautiful golf course and the natural sunlight filling the club itself proved an ideal venue for any Bicester wedding photographers. I started the day at the golf course with Richard to get photographs of him getting ready. There was a good mood in the room as the boys got ready and helped each other with the cufflinks & jackets etc. [youtube src=”http://youtu.be/2-uQRzfndxg?t=4s” size=”span3″ clearbottom=”false”]There was the usual issues with the tying of the cravat. I have yet to meet a groom who knows how to tie one. Lucky for them I learnt how from Youtube or there would be a lot of scruffy looking grooms at my weddings!! 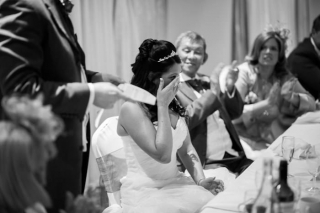 Should any bride’s reading this feel their H2B’s might need a little lesson in cravat tying, be sure to send them this little video so they can be prepared. The sun shone through the many windows of the club, cascading across the laughing and fun-loving guests as they gathered in the wedding room, decorated with white linen and a subtle but evident shade of lavender ribbon. Emma, stunning in her lovely classic white dress, while holding a tight bouquet of fresh white roses dotted with deep purple flowers, dashing her with just a touch of colour. Richard, in a charcoal grey tuxedo accented with a tie of purple, complimented his bride perfectly. 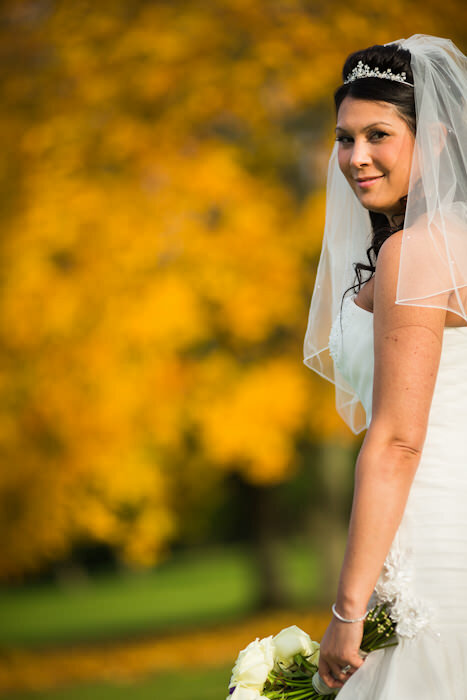 Following the emotion-filled ceremony, the country club had accommodated a request for 30 minutes of golfer-free access to the course for outside wedding photography in the natural beauty of the surrounding. We were whisked away in a chauffeur-driven golf buggy. I knew we had only half an hour for the shoot on the Bicester golf course, so I had made a to-do list to help us along. The low-lying sun lent itself perfectly to the gorgeous reds, oranges and golden colours of the autumn leaves, contrasted against the deep green of the course. I was provided with the ideal backdrop for extraordinary reportage wedding photography in the natural surroundings, as the happy couple proved a wonderful and gleeful subject for my lenses. Whisked back to the Bicester club, following our photoshoot on the course, we found the guests awaiting our return. 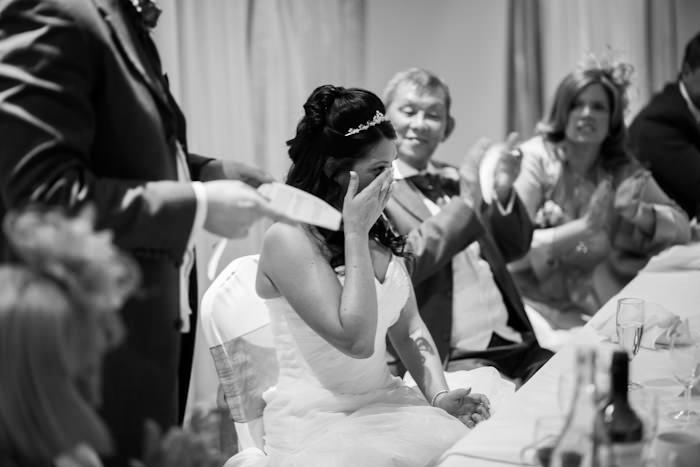 Not uncommon during wedding ceremonies, through the nearly constant laughter, tears filled Emma’s eyes as her new husband gave a very touching and heartfelt speech to his honoured guests and beautiful bride. Soon after, and as the wine and champagne flowed, the dancing ensued; laughter again filling the room. Bringing a tremendous energy burst, the extraordinarily popular song, Gangnam Style played over the sound system and the dance floor filled with jumping and bumping guests as the mayhem set in. It was a wonderfully happy ceremony and the reception proved to be a very fun event. I was proud to be the chosen Oxfordshire wedding photographer for this romantic and beautiful occasion. I wish the happy couple nothing but the best and give thanks for my involvement in your most important day.